Oh it’s a yummy treat for you today! Kyle serves up Superboy Prime Rib, and other delectables from his DC cookbook. For the main topic today though, we delve into a sizable but incomplete deck of 1991 Marvel trading cards, dealer’s choice! Quasar! Ghost Rider (call him Dan)! And fan favourite and one destined for ‘classic’ status…. Deathwatch! Plus who knew Quicksilver was so weak? All that plus 80’s WWF comic casting, Amazon Tick, Lazarus, Old Man Hawkeye and Bry releases his James Cameron hate like a tsunami! Plus a filthy bit on which muppet Kyle would go steady with and why…. it’s disturbing. 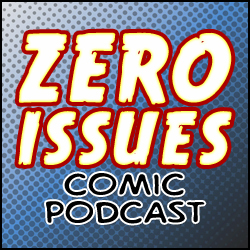 So get the kids and gather round because it’s time for Zero Issues Comic Podcast episode 126!!! !